Once upon a time, before there was Serato, before Fruity Loops and digital samples, there lived a DJ, producer, beat maker, and crate digger named Lou. This integral series has been sampled by many of hip-hop’s elite producers like DJ Premier(Gangstarr), Large Professor, The Bomb Squad(Public Enemy), Pete Rock, Dr. Dre, Marley Marl, J Dilla, Salaam Remi, Rhettmatic, Mr. Len, Kenny “Dope” Gonzalez and Just Blaze among countless others. “BreakBeat” Lou revived Ultimate Breaks & Beats with a producer series with Oh No, which debuted in January 2017 on Stones Throw Records. Oh No’s 17-track collection was made entirely with sources from the original UBB series. “BreakBeat” Lou founded the Original Beat Junky production company alongside world-renown editor and producer, the late Jose “Chep” Nunez. The two collaborated in producing for artists including 2 In a Room, Tim Dog, Ultramagnetic MCs, the late Scott LaRock, Paul C, as well as many other historic artists in hip- hop. 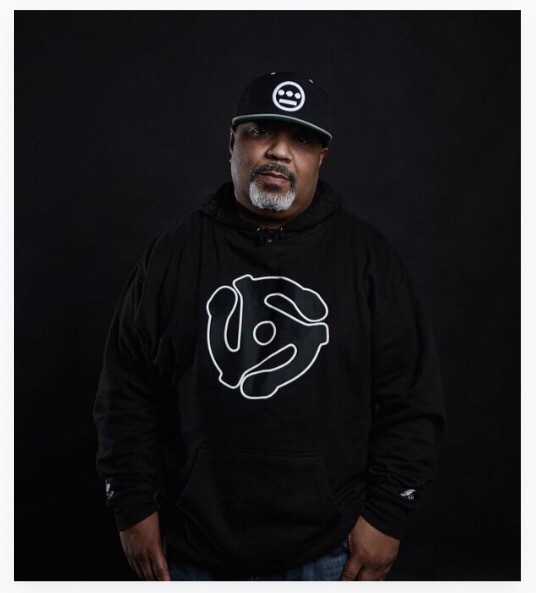 As a DJ, “BreakBeat” Lou has shared the stage with the likes of Afrika Bambaataa, KOOL DJ Red Alert, Grandwizzard Theodore, Biz Markie, Todd Terry, Rich Medina, Q-Bert, Lord Finesse, Boogie Blind, DJ Scratch, Peanut Butter Wolf, and Prince Paul. As a Producer, “BreakBeat” Lou has worked with Sean Price, Nejma Shea, Intikana, John Robinson, Opio, Craig G, Chali Tuna and Cadillac Freeze. “BreakBeat” Lou began his foray into speaking engagements (UBB Hip Hop 101: Origins and History) at university lecture halls including Yale and Stanford. In 2016, Music Director was added to the mix. In cities such as Minneapolis and San Jose, Lou provided the soundtrack and performed as himself for the play “DJ Latinidad,” merging new generations of Latino artists and playwrights with music.